There have been numerous debates about how to properly advertise a car. Some of the most infamous include Infiniti's debut campaign that never showed a vehicle or when Range Rover took a "risk" showing a vehicle caked with mud, at a time when every vehicle was always shown as if it just rolled off the showroom. But I have never seen an advertisement that shows only the engine cover as its beauty shot. 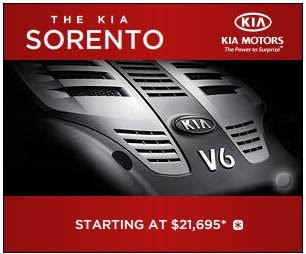 Enter the Kia Sorento. While reading the NY Times this evening, I noticed a rather puzzling shot of an engine block cover to the right of the article. Having removed an engine cover or two in my past, I knew what it was. But I doubt most people do, since very few of us open the hood of our cars. There is no call to action or no message surrounding the engine cover image. Instead, just a price and the vehicle's name. I wonder if many people would even know it was an advertisement for a car? On rollover, a message about the vehicle's horsepower is given. But is this for a car, truck, SUV, or crossover??? I doubt the click through rate on this ad is very high. It is being advertised in an upper funnel spot, outside of an automotive context, with an image that resembles the chest plate of some futuristic robot or some really expensive lawn mower. When advertising outside of an in-market automotive context, it is best to engage and interest the consumer, but to do so in a way that communicates who you are or gets them interested in what you are saying. A stale image of an engine cover with no engaging copy is the worst thing you can do. Kia has a compelling, low-price 5 passenger SUV in the Sorento that could be much better communicated to a large audience. It's a value product in an financially conscious time, so sell it on it's merits as a good buy without giving anything up (like moving to a small car for example.) Performance is not the Sorento's segment advantage or the care of most 5-passenger SUV consumers: value, versatility, and roominess are. So promote it in a way that interests a larger audience. Maybe when the Kia Soul gets released will Kia finally show a vehicle from outside its engine bay.